Joe Said So: Why send a postcard when you can share your vacation in real-time with Twitter and Facebook? Why send a postcard when you can share your vacation in real-time with Twitter and Facebook? While on vacation in Italy I passed by a postcard stand and realized something. Why would I send a postcard when I can share my vacation with family and friends in real-time via Twitter and Facebook? Postcards were once the ideal, inexpensive way of saying "hi" to your friends and family from a remote location - but now I think they're kinda cheesy. I mean, for the most part, postcards all have pretty generic photos - typically aerial shots of touristy locations - and they usually wind up getting delivered after I've already returned from vacation. When I travel, I like to use my cell phone or laptop to post status updates and upload photos of my experiences as they're happening. In my opinion, it's far more personal than sending a postcard because my friends and family can comment in real-time - it becomes more of a conversation. If my mom wants me to turn around and take a photo of what's behind me, I can do it. All she has to do is comment on a photo I've posted. It's really awesome when you think about it. So really, why do people still send/request postcards? Is a postcard more meaningful because it's handwritten? Is it more special because it passes through the postal system? Is it truly the most thoughtful way to share our travels with others or have we simply assigned meaning to it? Granted, not everyone is tech savvy, and I understand that the integration of technology into daily life is going to be a gradual process for some - but will postcards ever go away? Or are they here to stay? Post your opinion in the comments. I'm interested to know what you think. I have been following your trip on FB. The pictures are wonderful. You are so right. I'm never gonna send another postcard. What a brilliant way to share. I think you're kinda missing the point...postcards are more personal..handwritten, etc. "Bless Fran's heart, she wrote postcards. We just don't see that much of it anymore," Dubina said. "Thirty years from now, 40 years from now, who's going to say, 'Ooh, I just got an e-mail from Victor'? 'How did I get it? What happened?'" You're on vacation, you shouldn't be so tech obsessed that you share your every minute. Nobody wants to tune in to the (Insert Name Here)'s Vacation. Except for maybe your mother and significant other. In fact I think posting your pictures and doing daily updates is sort of lazy compared to sending a postcard. Postcards show you took the time and thought to send someone a special note. I am very tech savvy, I work in IT, but I would still consider a postcard is more meaningful then a tweet. Also like another person had said, what is mother or friend or girlfriend going to do, hold on to your tweet message? Doubtful, but maybe 15 years from now you and your significant other might look at the postcards you sent him/her from your travels. Great points! Who knew this would turn out to be such a hot topic!? I definitely get the sentimental value of having something that is hand-written as opposed to something virtual (like a tweet or online gallery). I guess my question is - why a postcard? Does it truly capture the moment? or is it just easy because it's there already? I just couldn't bring myself to buy any of the postcards on the stand because I thought they looked generic and tacky. Sure, the writing on the back would be my own self-expression, but what about the front? I just feel that there has to be a better way - maybe some middle ground. Nicholas, I do have to disagree about nobody wanting to tune in. I've gotten overwhelmingly positive feedback about the online galleries I've shared on my last couple of trips. I had them feed into my Twitter and Facebook accounts and people took it upon themselves to look. I've been approached countless times in person from people thanking me for sharing my trip with them - some of which I had no idea were even paying attention. We create so many rules about what we should and shouldn't be doing on vacation - why not give it a try? It doesn't have to be that you're obsessed with sharing EVERY minute of your trip (I sure didn't) but you can truly have fun with it - if you allow yourself. I am actually on the fence with my overall view on this one (but not for my own personal feelings on receiving postcards). I do not like getting postcards because of the guilt and clutter factor. I receive one, just like greeting cards, and I feel compelled to hold on to it. This creates clutter and often times a pile of stuff that takes up space. Often times, this pile of stuff gets moved from apartment to apartment (NYC living) and barely ever gets looked over. Now, as for seeing the tangible factor of a postcard, I get it. You get mail (which immediately is nostalgic since we usually get nothing of any meaning through the mail these days) and you see a message, in that persons hand writing, that traveled through foreign hands to your neighborhood post office and into your hands. So, why isnt a kodak picture used with an attached hand written card used rather than postcards? Why don't we do smoke signals or send morse code? I believe that tourist locations have made postcards easy---so, in being easy doesn't it just really cheapen the experience (if we really think about it?). So, as I said, there is no official ruling from me on postcards. I am on the fence. If you like postcards and want one from me---and I love you enough---you will get one. Let me get this right...we're all commenting on a technology blog here and complaining about the impersonal nature of technological advances? Why don't we all send Joe postcards instead of commenting on his post? That would better reinforce the point. 1. The definition of "vacation" should be in the eye of the beholder. Those who choose to publicly share their vacations with others obviously find enjoyment out of doing so. With the amazing synchronization capabilities between social networking sites, it doesn't take a lot of time or effort. And if you knew Joe like I do, you would understand that his BlackBerry is literally another one of his appendages. "Tech obsessed" is in his blood. 2. Nicholas, you make a broad generalization by saying that "Nobody wants to tune in to the (Insert Name Here)'s Vacation." Perhaps you don't, but other people may. Believe me, having the freedom to look at photos at your leisure is much better than the alternative...a dinner party where the 400+ photo slideshow is started and you nod off while the host explains every step he or she took. Some people do find enjoyment out of the real-time updates of other people...it's like vicarious vacationing! It all comes down to a matter of preference. 3. The postcard thing. Agreed, there is sentimental value attached and I greatly enjoy the art of handwriting. But let's stay objective here: some people have terrible penmanship. Also, if a tweet or an email or an online gallery holds enough sentimental value to you, you'll find a way to keep it that won't take up space in a drawer for 15 years. External hard drives are cheap and they hold everything you could possibly think of saving for a rainy day. Think about digital scrapbooking...your memories can literally be saved forever, without the fear of deterioration or other damage. Post cards are lame. Sure, they are personal, but its something I'd only expect from a girlfriend, wife, or mom. Everyone else in the world in my life will stick to social media. I send postcards from my iPhone. (Yes printed and mailed like old time postcards.) Best of both worlds. You'll need the app: SnapShot Postcard. I know this post is from years ago, but I had to comment. You're all missing the point of postcards. 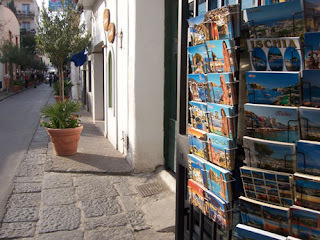 By sending a postcard you are sending a piece of your vacation. You are sending something that came from the place you visited, and you are sending a note that means that while the person was writing the postcard.... they postcard recipient shared some vacation time with them. If you can't be there..... knowing that you "shared" some time there is the next best thing. It's more personal than just seeing the uploaded picture album on Facebook. Plus you get something pretty to put on your fridge. :) Or trash it. It doesnt matter, its up to you. It's the thought that counts. Just knowing that your friend took the time to think of you on their vacation speaks volumes. Google for SendMyPostcards. It combines technology with a personal touch. It's really great! I think it is up to the individual. Me I love postcards and I send about 100 per year! I use them all the time to just communicate or whether I/we are traveling. To me email can be boring! Hey that is just me and I will not say to you that your wrong for using email/social media. It's all about personal preference and remember this is still the United States of America where we are free to choose. So when you recieve a postcards, emails, status updates or tweets just remember to do your best to preserve these as these are look back to your past. Kind of like a journal. I really enjoy looking at old postcards to see what people were doing years ago. Anyway have fun on your travels!